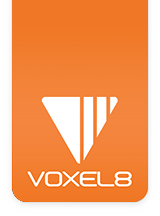 This section covers a basic overview of the Voxel8 Developer's Kit touch panel and its features. It is located on the right front of the Printer (see below, Picture 001). Picture 001: The Voxel8 Touch Panel location. When the Voxel8 Developer's Kit machine is powered (see Picture 002), it will display many useful screens that you will use in conjunction with the online Voxel8 Dashboard. In this article we give you a high level overview of each section and what it does, as well as pointing you to any tips and tricks for operating via the touchscreen interface. Picture 002: The Voxel8 Front Panel Display. The top of the Voxel8 Developer's Kit touch panel has a top status bar (see Picture 003 and 004) which has useful information about your print job (in the top right hand side). Picture 003: Touch Screen Status Bar. Picture 004: Top navigation bar on the Touch screen. You will use the top status bar to figure out what state your Printer is in before, during, and after 3D prints. NOTE: You should get in the habit of looking at the temperature indicators to always make sure you are not going to touch the hot FFF extruder or build plate before maintenance and/or machine operation. This is the temperature that the FFF Extruder is running at in C.
nozzle temperature (in C) reported by printer. NOTE: You should never touch the FFF extruder nozzle when it is at a warm/hot temperature. This indicates the current build plate temperature inside the Voxel8 printer. build plate temperature (in C) reported by printer. NOTE: You should never touch the build plate while it is hot. This is the name of the printer assigned through Dashboard. If you want to change it, it's under settings inside of the Voxel8 Dashboard. printer is connected and ready. Picture 005a: Printer Status Icon. This icon indicates that the network is active and running (see Picture 006c). A solid world icon represents that the printer is connected to Dashboard. Physical ethernet connection is active. Printer is not connected to a network. Printer is attempting to broadcast wirelessly. Picture 006b: Network Status Chart. Picture 006c: Generic status icons. The Printer Info area gives information (see Picture 007) about Network connection (either WiFi or Ethernet), uptime of the Printer (i.e. how long it's been on), as well as the activation password, and the connections status between the control interface (i.e. OctoPrint) and the underlying hardware of the Printer. Picture 007: Printer Info Screen. This is where you configure the WiFi connection for your printer (see Picture 008). You can Refresh to see a current list of available Wifi networks, or forget a network in order to try to reconnect to it. It also includes a virtual keyboard for you to type in your WEP/WPA key. For more information on networking setup, please refer to the Setting up Printer Network Configurations. Picture 008: WiFi Settings Screen. In addition to the power button on the back left hand side of the machine, there is a shutdown command within the settings panel (see Picture 009). This is meant for a quicker way to respond to machine shutdown from the front. You will still need to confirm the shutdown, however. This screen (see Picture 010) is for registering and activating your Voxel8 Developer's Kit Printer when you first receive it. This process only happens during the first boot of your machine, or when accessed under the "Settings" menu of the touch screen after that point. Your unique access token is listed here. NOTE: The activation code below is a mock one, yours will be different and the one below is not valid. This procedure is covered in the Visual Start Guide under the Printer Activation section. Below, we describe what each of this features and where it might be used, and why. The "Align" (i.e. short for "Alignment") button (see Picture 011a & b) is an integral step to printing multi-materials on your Voxel8 Developer's Kit Printer. Picture 011a: Alignment is located under Printer Control. Picture 011b: Starting the Alignment Process. When you're ready to 3D print, you'll be using the Print button (see Picture 012) after selecting a job from the list of prints on a machine. The File List is the main area where all Voxel8 Print jobs are stored in a linear list (see Picture 013 & 014). To print an entry from the list, you touch to select it, which will bring you into the "Print" screen. You can navigate up and down the list of items to print by using the up and down arrows on the left side of the navigation. Picture 013: File Listing (empty) Screen. Picture 014: File Listing Screen. There are a few error screens within the touch panel interface that you'll want to be acquainted with in case you happen upon them. You will receive this error message (see Picture 015) in several scenarios. The most common is that the Voxel8 Developer's Printer has lost connection to the internal Control Interface running on the Printer. When this message appears, you will want to try to "RECONNECT" first. Next, try accessing the printer from Dashboard and see if it's still activate and alive through the Voxel8 Control Interface. If that does not work, then you'll want to try power cycling your machine as a last result. Picture 015: "Printer is not ready' - Cannot connect to Control Interface Error Screen. Now that you are familiar with some of the touchscreen areas of functionality, it's time to take a further look at the Voxel8 Dashboard. This button disengages the core XYZ motors (see Picture 016) so that you can freely move the printhead carriage around. You'll want to use this in maintenance and troubleshooting issues in order to move the print heads out of the way manually. Picture 016: Stop all Motors Screen. This is the preferred method of loading filament (see Picture 017) into the Voxel8 Developer's Kit printer. Once you press the button, the machine will first heat up the extruder and step through the processes to fed filament into the machine. Picture 017: Load Filament Screen. This is the preferred method of unloading filament from the Voxel8 Developer's Kit printer (see Picture 018). To remove the filament from the machine, you will hit the button and wait for it to heat up to melting temperature, and then simultaneously press the black lever on top of the FFF extruder and pull out the filament. Picture 018: Unload Filament Screen. This feature (see Picture 019) allows you to dispense thermoplastic to determine if the filament is loaded and printing properly. Picture 019: Print Plastic Trace Screen. This will print the silver calibration trace (see Picture 020) in the upper right hand corner of the build plate. It is for testing to see if the silver is dispensing properly. Picture 020: Printer Silver Trace Screen. This feature runs the FFF thermoplastic wiping procedure (see Picture 021). When activated the FFF printhead (i.e. Toolhead 0) will move to brush against the silicon strip in the leftmost wiping station freeing any debris from the nozzle tip and clearing it for a new print job. Picture 021: Wipe Plastic Screen. This feature runs the silver wiping procedure (see Picture 022), where the right print head for silver (i.e. Toolhead 1) will rotate in a circular pattern around the rightmost wiping sponge station. Picture 022: Wipe Silver Screen. Note: It's recommended to keep the sponge regularly damp by adding a couple drops of the Voxel8 Solvent to the sponge before running this script, but also most definitely before printing silver (if it has not been done in a while). This is a convenience feature so that you can perform maintenance on the silver syringe and nozzle (see Picture 023). It is not a requirement to use, but it can make it easier to remove the barrel syringe. You can insert/remove the syringe without using it if you prefer. Picture 023: Change Syringe/Tip Screen. This is an easy way to raise up the silver printhead (see Picture 024) and nozzle so that you access underneath in the build plate area. This feature is mostly for troubleshooting. Picture 024: Raise Silver Screen. This is an easy way to lower the silver printhead (see Picture 025) if you want to see the condition of the nozzle for troubleshooting, or other reasons. When activated there will be a quick striking action when the nozzle drops down quickly. Picture 025: Lower Silver Screen. If you need the printhead to the home position of x,y and z; then this feature does it (see Picture 026). It's a good way of testing if the Core XY and Z are functioning properly during troubleshooting and after any maintenance procedures. Picture 026: Home XYZ Screen. This does the build plate leveling procedure (see Picture 027). When activated, the machine will use the laser distance ranger and determine z-height between the FFF extruder nozzle and the build plate. When you run the main Alignment procedure, this is included as well as the silver alignment for the right most toolhead. Picture 027: Align Plastic Screen. This outputs a simple diagnostic print. When troubleshooting printing issues, this comes in handy (see Picture 028). Picture 028: Diagnostic Print Screen.